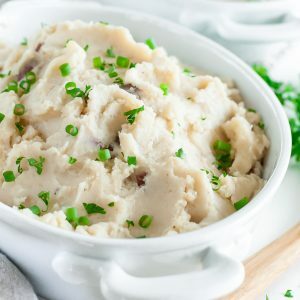 Slow Cooker Creamy Cauliflower Mashed Potatoes are a total holiday game changer. Kick things up this Thanksgiving with this easy + nutritious swap! Trim your cauliflower from the stem into clusters and chop your potatoes (skin on or off - I left mine on since it's nutritious + tasty!) into 1 inch cubes. Combine with minced garlic, broth, butter, salt, and pepper in a 4-6 quart slow cooker covered. Cook on high for 4 hours until tender. Use a potato masher (or some serious ninja skills with a fork) to coarsely mash the veggies. Don't over mash, they're fabulous thick and fluffy. Transfer to a large bowl and stir in greek yogurt, cream cheese, and garlic powder (I love the extra burst of garlic) plus any extras to taste. Season with salt and pepper as desired and serve hot! Want to get a leg up on your holiday meal planning? This super tasty slow cooker dish can be made up to 3 days in advance! It reheats like a champ (you can use the oven, stove-top, microwave OR slow cooker on the warming setting) and tastes amazing every which way! We basically lived off this sassy side for 3 days straight after making it and cannot wait to make it again! Garnish with all your favorites! Add anything from green onion to parsley to cheddar and bacon. Anything goes!